Makes your network connections faster. Is there a better alternative to PimpMyOSX? Is PimpMyOSX really the best app in Optimizers category? Will PimpMyOSX work good on macOS 10.13.4? PimpMyOSX is a easy to use Mac application that makes your network connections faster. How does it do it? 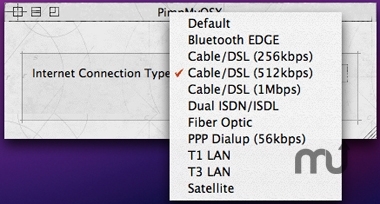 It optimizes the OSX network performance by tuning kernel parameters to match your network environment. One selects a network type such as cable modem, telephone dial up, DSL, etc. then PimpMyOSX makes the adjustment. If the computer is rebooted, the settings remain in place. That's it! A 20% or more performance INCREASE can be expected! Version 1.4 - Changed some of the parameters to take into account the fact that maximum socket buffer size in Mac OS X is limited by the available system RAM. PimpMyOSX needs a rating. Be the first to rate this app and get the discussion started! The performance adjustments are performed On the Fly. Adjustments are made to BSD kernel networking tunable (and other OS) parameters. PimpMyOSX tweaks network memory buffers used for TCP data transfers. The 'chunks' of data transferred are properly sized for your network connection (for example, cable modem, dsl, bluetooth, etc.). For similar products, we optimize largest number of network types.